The current state of mass food production has duped us into believing things like milk, eggs, and grains cost much less than they actually do or should. For example: Even though we have our own milk cow, our milk technically costs me MORE than it would to simply buy a gallon at the grocery store. The good news? Saving money isn’t the primary reason we’ve chosen to own a cow. For us, it’s really about the quality of the product; our milk is fresh, beyond organic, and wonderfully raw. Not to mention owning a cow just plain makes me happy, so it’s a quality of life thing for us as well. Chickens and eggs fall into the same category. While it depends on feed prices in your area, I’m still going to venture to say if you are looking for “frugal” eggs, you’ll probably be better off to buy eggs from the store. But, that’s not the reason most of us keep chickens, right? We love the bright yellow yolks, the satisfaction of watching the hens peck around the yard, and all that comes with chicken-ownership. 1. Shop around. When I started calling different feed mills, I was surprised at the huge difference in prices. Just remember– cheaper isn’t always better, and if you are feeding an ultra low-quality feed, it can be very hard on your birds. Never sacrifice your chickens’ health just to save a buck. 2. Mix your own feed. I say this with a wee bit of hesitation, since depending on your situation, it may actually be MORE expensive to mix your own feed… However, I do suggest finding a recipe you like (all my homemade chicken feed recipes are in my Natural Homestead book), and then shopping around with local feed stores to see how much it would cost for them to mix it for you. Also, don’t forget to check with the local farmers in your area. Sometimes they’ll have older grains sitting around that aren’t fit for human use, but would be fabulous for your flock. 3. Buy feed in bulk. I buy everything in bulk, including my chicken feed. Often feed stores will give you a cut if you purchase a pallet of feed, rather than just a bag or two. Another trick is to split a large order with a friend. My one caveat is this: chicken feed which has been ground/processed/cracked, rapidly looses nutrition as it sits. 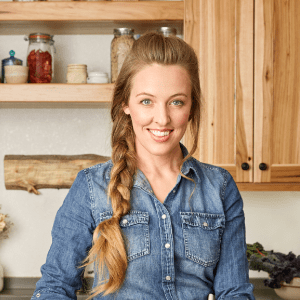 It’s probably not a good idea to purchase a year’s supply at a time, unless you are using a recipe that calls for whole grains–they are much more shelf-stable. 4. Ferment your chicken feed. 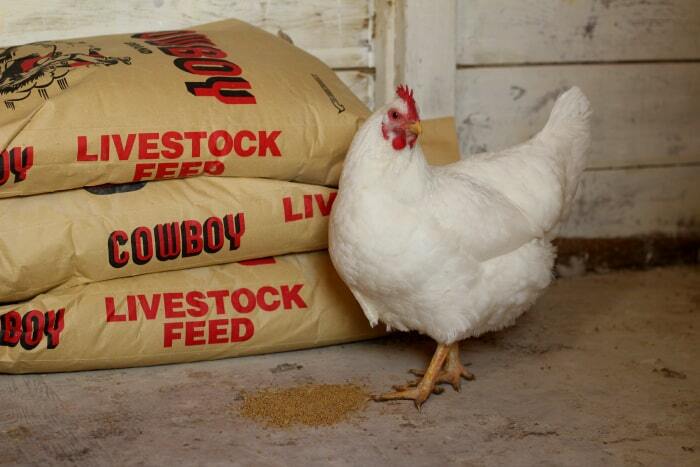 Fermenting your chicken feed greatly increases nutrition, and decreases the amount they eat. The same goes for sprouting. 5. Stop feeding free-choice. This is actually a topic with a bit of debate surrounding it… (Have you noticed everything causes a debate these days?) While I like the thought of allowing my flock to self-regulate, it can be a problem if you have lots of rodents. Rats and mice think free-choice chicken feeding is the best thing ever, and if you struggle with rodent problems in your coop, it’s likely your all-you-can-eat grain buffet is to blame. This problem can be avoided by only feeding as much as your chickens can eat in one day. 6. Free range as much as possible. I realize this isn’t possible for everyone, but if you can, allow your chickens to roam around your yard. Not only will this greatly supplement their diet, it can also help to control bug populations, and keeps them from becoming bored. Plus, there is something so soothing about watching chickens scratch around your front porch. 8. Ask for leftover vegetable and fruit scraps at the grocery store. Not all stores will allow this, but ask if you can have the wilted lettuce, squishy tomatoes, and bruised apples. Some folks also collect stale bread items from bakeries, but I personally avoid this. Many of the bread items sold in stores like donuts, breads, rolls, or muffins are made with heavily processed ingredients and additives. They might be okay for the occasional treat, but they aren’t something I’d recommend feeding on a regular basis– just as humans shouldn’t eat them as the bulk of their diet. 9. Grow your own feedstuffs. Grains, cover crops, greens, sunflowers, and various veggies are good places to start. 10. Grow duckweed. I haven’t tried growing my own duckweed yet, but I’m totally intrigued! Duckweed is a high protein plant that can be fed to a variety of animals, including chickens. If you’re a duckweed grower, please leave a comment and share your wisdom! 11. Raise soldier grubs. As tough as I like to think I am, I must confess I’m still not quite ready to tackle the whole concept of raising grubs/larvae for my birds. Do I think it’s incredibly smart? YES. Do I think it’s a fabulous way to create low-cost, high-protein feed? YES. Do I want to get up-close-and personal with maggots? Eh, not quite yet. If you’re braver than me, my chicken-keeping idol, Harvey Ussery, has a chapter in his book (affiliate link) devoted entirely to cultivating soldier grubs. 13. Save kitchen scraps for your flock. I keep a small bucket on my kitchen counter at all times and continually toss in bits of leftover bread, celery ends, carrot peelings, watermelon rinds, and more. It’s a feeding frenzy when I show up at the coop. My chickens have even been known to chase me down in the yard when they see me carrying any sort of white bucket. It’s insanely satisfying to watch your birds turn kitchen waste into orange-yolked eggs. 14. Sell eggs. 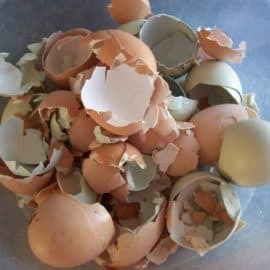 Yeah, I know this isn’t exactly a way to save money on feed, but selling excess eggs is a wonderful way to offset feed costs, and make your chickens pay for themselves. Plus, there is always someone wanting farm-fresh eggs! 15. Cull non-productive members of the flock. I know many of you keep chickens as pets, and that’s great. But if you are truly trying to cut costs, it may be time to turn non-producing hens into nourishing chicken soup. I know this thought might cause some of you to recoil in horror, but keep in mind this is exactly what great-grandma would have done. 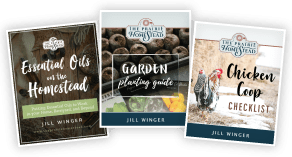 Natural Homestead— my latest eBook that’ll help you mix your own chicken feeds, create herbal supplements, fight garden pests naturally, and lots more. 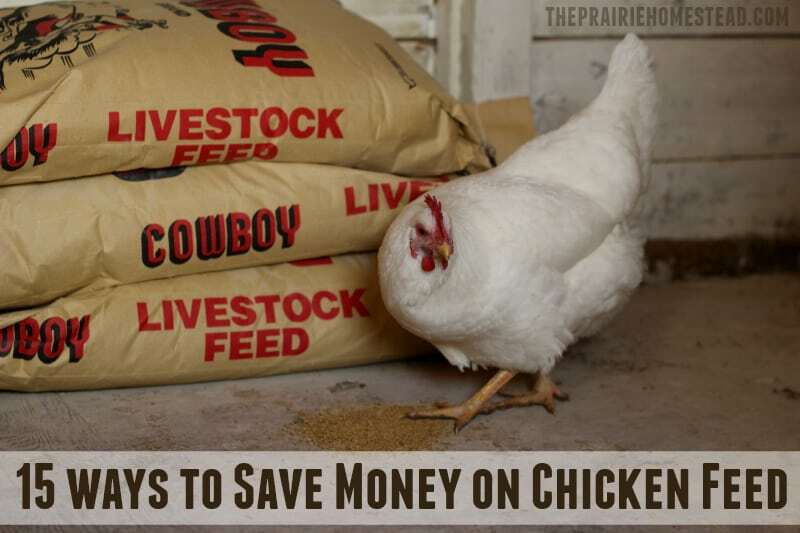 What are YOUR best tips to save money on chicken feed? Leave a comment! 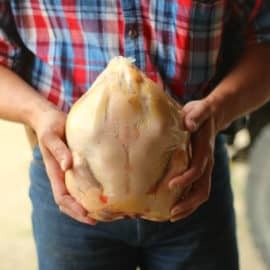 We raise chickens and use many of the methods you mention. I enjoy watching our chickens run around the property. They do bring me a lot of joy! We do alot of these things listed already. I live in AR where hardly anything is grown/produced so finding a farmer is next to impossible. I thought giving very much fruit to chickens caused them to slow down egg production? Actually quite the contrary.. fruit will help with egg production. The sugars in it work quite well. My chickies LOVE berries, fruit, melon rinds, etc., but it is citrus fruit that you should limit. I don’t give mine any grapefruit, orange, lemon, lime, etc. Perhaps this is what you had heard that should be limited! I just learned about duckweed and azolla! I ordered some organic starts and will be feeding it to my chickens and dairy goats soon! I gave the sprouted barley fodder thing a go last year, but it was complicated and messy and took up too much space in my dining room. The duckweed and azolla seem like they will be easier to keep and the excess will feed my garden. I use just about every method you listed and want to offer one more for your list. It may be too “icky” for some city folks but it helps. Maggot buckets. Get a, one to five gallon bucket with lid, drill some holes in the sides and lots of holes all over the bottom. I hang this bucket with bailing twine from the rafters. Most farms and homesteads will have some animal death, be it a dead chicken or cat or rodent, with gloves I place the dead critter in the bucket and cover,( you can also use any spoiled meat products from the kitchen) The fly’s are attracted to the meat and lay eggs, the maggots must drop down to the soil to continue the life cycle and the chickens love both the flys and the maggots. I’ve never notice much of a smell problem and after a month or so (depending on weather) I just bury the fir/feathers and bones. That sounds like a good idea, but in many states that is inviting bears in for a tasty treat.The smell might attract other predators in as well even just in curiosity. Cat little buckets would work pretty well for this too as they dont seal shut all the way. Learned this the hard way when i had a “compost bucket” out my back door. I dont know what it is about maggots that make me gag. Never fails, i see maggots I gag. Actually it’s the opposite.. It reduces flies, as you are breaking their life cycle by having the maggots eaten. I use a shovelful of *fresh* horse manure in a cat litter bucket. It works just as well as a carcass, and I have an endless supply of horse manure! I purchase my chicken feed from a local Amish farmer. It is tested for 60 ingredients and certified nonGMO. It is healthier AND cheaper than anything I can find anywhere else. That sounds like a fabulous option! Great post – and timely too as our feed costs and egg production are sadly in stark contrast to each other! Our girls love the extra whey we give them from our goat cheese making. It makes me feel like I’m not wasting a thing from our farmland. Great ideas! I will be sure to call around! My tip may not be for everyone, but it’s more conventional if you want that extra buck – cancel CABLE. We canceled about 3 years ago, and are no worse for the wear. Plus, it just happens to be (about) the same price per month as keeping 14 chickens 🙂 and let’s face it, why are you watching tv when you’ve got so many chickens to entertain you?!
? ?about 5yrs for us. we decided cable was a negative in our lives. The ?marks shud be thumbs up emojis. guess this prog. doesn’t recognize them. We cancelled 9 years ago and never looked back. Couldn’t bear the thought of paying $100+ month when we surfed all night long looking for a suitable channel/show to watch and never could. Best decision ever…PLUS we found that farming/homesteading left is so satisfyingly tired at the end of the day we didn’t have time for TV, just sleep. Hilarious!! We cancelled everything long ago and don’t miss it, but I tend to be obsessively frugal with certain things and somehow your tip makes me feel better that I do still have to buy chicken feed… at least I get a return on my investment! I too have read Ussery’s book cover to cover. Great stuff! I started a mealworm colony by recycling an old 5 gallon aquarium in my garage left over from our kid’s gerbil keeping days. Easy peasy! No odor. Use wheat bran or oatmeal for bedding. Feed sprouted potatoes, cabbage cores, apple cores, carrots, etc as kitchen waste. The girls absolutely LOVE them and will jump for them!! It’s a high protein snack especially for molting season. The best thing is, it is perpetual…their lifecycle repeats itself without any attention from you & they make great non-gooey fishing bait! Got tips from Pinterest & tweaked the setup to be as self sustaining (less work) as possible. Great article! I look for anthills around the property and shovel them into the chicken run. They love it! It didn’t take long to realize that “homegrown” eggs were expensive. However, they are better for us which is part of this homesteading thing we are doing. I feed them fermented feed. They LOVE it. Much healthier too. I’m trying to find a good source for seed to sprout. Those little garden packets just don’t cut it. We went to the local Farmers Union and bought 30lb bag of Winter Rye for $12.00. They were selling it as a winter cover crop. It Sprouts great and lots cheaper than grains from Bob’s Red Mill where I use to buy sprouting grains. When need be I sprout Lentils or Quinoa also. Yes– I love feeding back eggshells too. And feel free to share any posts you like! Our local coop will fill up our trashcans (in an open trailer) with grains or cracked corn or even specially-mixed feed, if we call ahead. It’s even cheaper than buying it by the pallet at the feed store! That is awesome! Love this idea. I buy non GMO or soy feed I mix with flax seed that you can buy for $1 lbs oyster crack shell and crack non GMO corn mix all together last me like 3 weeks $45 plus I feed them all the peels from my veggies that I cook that day, cook rice left overs, pasta left over, salmon left over you can give them the eggs shell after you cook your eggs, and When I have to much eggs,I make them scramble eggs in coconut oil, they are always hungry lol plus they eat hrass all day long, I love my 6 ladies and their orange yolk egg color they are so much fun. I couldn’t afford my flock of I 45$ every three weeks for only 6 chickens. We buy 1 bag scratch and 1 bag pellets at 50lb for 10.99, mix together and it cost 22.00, that feeds my 8 hens, 3 roosters, 3 ducks, and 2 Guineas for a month. During the day they forage in the yard for bugs and grass seeds. Eggs are the best I’ve ever had. Kids tend to favor duck eggs over anything. I was told the other day by a farmer/rancher here in the Kern River Valley that black eyed peas are excellent feed for chickens, high in protein, much better then corn scratch. You must hydrate first in water for a day before feeding. He sell then 300 pounds for $75.00 and supplies a water proof container. Check in your area for some one that sell them. Good tip Cinda– thank you! You can grow field peas by just throwing them in the yard in spring and fall. They will outgrow the grass and weeds. Just now around the area and leave them alone. Simple old farmed trick. I’m new to your site this morning but will bookmark when done here. Great stuff, good writing and pictures. I came here after googling how to set up a homestead dairy. I plan to add a small room on the house-side of our future barn and wanted to see different set ups. We grow some of our feed and do most of the other suggestions as well. We sell our excess eggs which pays our store bought grain bill. However, our turkeys eat more and we can’t keep up. No eggs to sell this time of year. Lesson learned, time your hatchings earlier in year so they will be ready for processing before winter arrives. Second lesson, be cautious buying incubator off craigslist. The “lessons learned” never stops. That’s what makes this life interesting. Thank you for taking the time and effort to share your experiences. Oops, the link in my above comment was incorrect ( my name). This should work. Thanks for sharing your tips Pam– so glad you found the blog! I’ve been poking around your blog a bit and I’m in love with it! Like you, I’ve have a pretty conventional childhood but I’ve always been fascinated by old-fashioned traditions and values. I grew up reading books like Little House on the Prairie and anything by Janette Oke and I would play make-believe and pretend I lived on a homestead. Though I’m still a young’n attending college, I hope to someday raise a family of my own on a homestead while living a natural, healthy lifestyle that is honoring to Jesus! Thank you for your blog and all the great information you share! So nice to meet you Katy– sounds like we have a ton in common! Thank you for posting this! We found that feeding pellets instead of crumbles, and garden greens really cut down on our cost, but it is great to have so many more ideas! You are absolutely correct! We are very misled about what food really costs. Thanks for the truth. I think you thought of everything! Nice post with some great ideas. We enjoy #6, free ranging the best. I also overturn large chunks of wood and the hens go crazy to get at all the worms and bugs. The cost of the eggs is definitely surprising! We’ve begun to sell our extra eggs and that just about covers the cost of feed. Last summer we were able to fill up our feed sacks with seed screenings from a local farmers field for free! We fed them nearly all summer on that and our garden’s extras (and all the yummies they could find in their large forested run). I love the idea of growing some of our own feed, and extra veggies just for the flock. Great post! We do many of these same things to save money. We grow a lot of comfrey during the growing season and we harvest and dry it for the chickens and other livestock. If you harvest it at the right time it is one of the highest protein plants! We grow a duckweed in our tilapia aquaponic set up but we don’t get enough to feed to the chickens. I am working on plans this winter to start growing it in the spring! It would be a great food source fresh and dried! I enjoy your blog. I have a pond full of duckweed. I do feed it to my chickens. They will eat it, but it is not their favorite food. I mix it with my chicken feed (50%). It is a lot of work to harvest and dry. Once it is dry I store it in a large drum. It will mold if not completely dry. By mixing with the chicken feed, I can make a 50lb bag last about a month (have 7 chickens). Thanks for chiming in, David! Good to know about the mixing, too! just start putting fresh duck weed in a pool I can’t grow enough for my chickens to quit eating it they prefer it over grains. So, how do you tell which chickens are not producing? I would love to cull them, if I just knew who they are! We have 16 Americauna hens and they pay for their feed monthly by selling eggs back at the feed store…some Monday mornings there are people waiting for our eggs or following us back in the store for some!!! And this isn’t a high priced area for eggs. $2 a dozen is max. But 7 dozen eggs a week pays for their feed and they new chicks we buy every spring. We basically eggs the small eggs. Often our kids come buy and theirs are free, of course. All scraps go to the chickens and I make spouts every week…start feeding them as day old chicks and they will follow me anywhere for sprout! Usually wheat but barley,rye,teff have all been tried. One thing I know is to not feed a lot of corn as your will find them full of fat when they quit laying..lean and mean egg laying machines is what you want. Not freeloaders. I know some people have “pet” chickens but this farm expects everything to help pay the bills. Great post my husband and I are working on getting a mixer grinder to make our own feed right now to cut costs. He is a truck driver and plans to haul wheat this year so we may be able to find cheap feed to haul back home from other areas. We free range our chickens when ever possible we see a huge difference in our feed bill from winter to summer. Here in North East Montana it gets pretty chilly for the ladies to be out in winter. Due to our isolation we are stuck with only the elevator for feed so we are at their mercy, this drives us to be more creative. Love the mixer/grinder idea– how cool! The Cowboy and I have been having this very same debate around here. We decided to skip chickens this year and try and do a large garden instead! Hope you have some posts coming up about gardening in dry and windy Wyoming! People don’t realize that our food costs so little because it’s all subsidized by the government. We pay a lot for food, it’s just not all paid at the grocery store. As for the maggot buckets, very intriguing! I don’t really want more flies around though. So we’re planning to have chickens as soon as we buy a home (in the next 4 months). I’d love to free range them, both to save costs and reduce bugs. But I hear they destroy even an established garden if allowed to free-roam. So can we let them loose in the yard? I don’t want a lawn, so if they’d eat it down to the ground AND it was nutritious for them, that’s be the best of all worlds. 🙂 I’m sure we’d need to fence it to keep them from escaping (or domestic pets from coming in after them) as well. Yes– they are hard on gardens! But mine do great rummaging around the yard. I have incorporated many of your ideas that you have listed. I don’t have a dairy cow but I do buy milk in plastic jugs and when the jug is almost empty, I fill the jug with water and give it to the chickens. I also crush my eggs from cooking and feed them back to the chickens. I have also found that if I feed the chickens pelleted feed instead of crumbled feed they don’t waste as much. The chickens also have lots of free range time out in the grass and the area around the chicken coop. I lost a hen a week or so ago from either a hawk or a fox that lives near by. As for weeding out the non- producers, that is a tough decision. I have four of my original hens left and I just can’t imagine putting them in the stew pot. In fact I had to bring one in the house yesterday because she hurt her leg, but she is standing on it this morning, so it is back to the hen house today. I look forward to your post on Wednesday. There is always something useful to read and think about. I am a commercial cook and where ever I work I do the “chook bucket”. i make it part of my wage deal when i start at a new place. All scraps go into that and I take it home at the end of shift. To be honest cooking for a job does not pay much and is hard work so any fringe benefits like extras for the chooks or the dogs makes it more worth while to me when I bring treats home. I also do the weed and feed option and this reduces my waste in the garden as well as feeds the girls. Sprouting alfalfa and similar seeds boost my baby chicks/ducklings/poults along and the greens are great fillers so they eat less crumble. I train my ducks to come back when called with a feed bucket so I can release them down on the creek to forage and get them home safe before dark. I love this Kylie! I wish more cooks did this! I have 6 girls in an over-priced tractor on our .4 acre. We also started meat birds last year. Big learning curve with the meaties. But we’re actually doing 2 batches this year, so it can’t have been that bad! I wanted to ferment their feed, but I think I was making too much at one time (once it turned too sour they refused it), and I couldn’t figure out how to give it to them without it spilling all over the place out of the troughs. I gave it up for the winter, because I was frustrated and also I couldn’t figure out how to keep it from freezing without keeping it inside where the smell would get to us (my daughter is a supper-smeller). I’d be willing to give it another go especially for the broilers if I can figure out the spilling problem. Right now my girls are rarely leaving the covered indoor part of the tractor. They hate the snow and cold! and I’m getting no eggs at all. But we just bought a juicer, and I hadn’t thought to give them the pulp! They came out this morning and were happy birds indeed. I must say that although I raise meat birds, these first 6 hens are the “Lucky Clucker Club” who will live out their natural lives and be buried in the back yard with grave markers next to the cat. Any more we get, I won’t promise that. But Bunny, Red, Buttercup, Asoka, Padme, and Anikin Skyclucker the Jedi Chicken need have nothing to fear. We’ve had alot of success free ranging our girls, we keep 20 or so chickens, some ducks, geese, and turkeys, and weve never had predator problems since we added the larger birds to the flock. Zuchinni grows here like weeds so i grow several hills just for them to eat, along with leftovers from surplus garden crops. 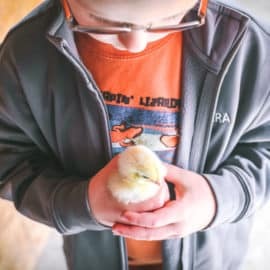 I order my chicks in big orders and sell the extras as laying hens, i can pay for my entire chick order plus several months of feed by doing this because most people around me want beautiful laying hens without dealing with chicks. i absolutely love your blog, it is helping us be more self-sufficient, even though my parents think im nuts, lol! We have lots of wild raspberry bushes right near our chicken coop. The chickens go crazy when I am picking the berries. Of course I give them some which they absolutely love! Love all the suggestions as this is a conversation we’ve had around here on more than one occasion! I would use caution, though, about giving chickens pulled grass and weeds. If the roots aren’t attached the chicken will take in blades of grass several inches long (rather than smaller, broken pecked off pieces). These long pieces can get trapped in the crop causing crop compaction and/or sour crop; they just can’t process them. I learned the hard way on this one (even after several tippings from which long pieces off grass were pulled out &, sour crop treatments she still died). Have you ever heard of Korean Natural Farming? We have an acre of land in the city and we want to have chickens (we can have up to 4.) What we don’t want is a lot of the smell, flies, bugs (etc.) and a lot of extra work cleaning out the coop. In his pursuit of this on YouTube my husband stumbled upn KNF on YouTube. From what we’ve learned so far (which isn’t much), this process makes a living floor for the chickens to walk on. When they defecate the IMO’s (Indigenous Micro Organisms) – that you collect and grow and then innoculate the floor with – eat the feces and prevent it from smelling which means you never have to clean out the chicken run but it never smells AND the floor actually becomes 10% of their healthy feed. Hawaii Natural Farming has a series on collecting and growing the IMOs but I am trying to locate someone who has used this system so we could ask questions, etc, on how to get started. Oh, and apparently, a similar system can be used for pigs so that the pigpen never smells, you never have to clean it out and there are no flies. Crazy, huh? Are you familiar with either of these? Deep litter. Providing oyster shell can reduce feed consumption up to around 7% as hens will eat more feed than they need to obtain calcium. Provide hulled oats or wheat. Hens who do not need the protein of full heavy production will tend to eat less layer feed and more grain. I buy store brought laying pellets for $11.00 a bag. I think the bag is a 20 kilo bag. Oh I almost forgot, I live in Hillcrest Queensland Australia. I also give them the left over food scraps and other scraps from the kitchen. I don’t give them onions, garlic or chillies. I have 15 chickens that includes 2 roosters, (I had brought 1 rooster with my hens and one of my hens be came Brody. She sat on 1 egg. Hatch in to another rooster) 8 dicks and a Guinea Fowl. I am looking for a nother Guinea Fowl so she can have a boyfriend. My husband feeds the chickens before i get up. He is usually up at 5.30 am. Then when I get up i open up the pen and let them free range all day b 4 putting them in the pen at nite. I am new at this and want to know if they have had laying pellets in the mornings do I need to give them laying pellets again at night. Also how can i move my ducks and their nest away from the crows. My ducks Mr and Mrs Jerry and Germima Puddleduck are nesting and sitting on 12 eggs. I have about 3 to 4 crows that hand around. I dont want then to get the eggs or the baby ducks when they hatch. Also how long do it take for a duck eggs to hatch. Is it the same as chicken eggs? If possible l,d put a cage or wored frame over your duck until they are hatched….even the crows will drag the young through the wire if its large enough. The have no mercy. Until they are several weeks old they will not be safe even on the water. I am getting started with chickens, our neighbor has given us a rabbit hutch that he modified for chickens. We are surrounded by farmers, they give us what they can’t sell. Just read through this and wanted to post up a reply regarding the duckweed and soldier grubs, we do both. Our current flock is 50+ birds on an acre of semi-wooded south Texas land and it’s surprising how much they eat. We ferment the feed we get from a local feed store so it does last a bit. The soldier grubs (Black Soldier Fly larvae) are amazing little things. I’ve got a bin built based on what I saw on youtube that provides us with about 3lbs of feed grubs a day. We put all of our kitchen waste in there along with the trimmings from the garden and to be honest any of the pest animals that we trap and kill on the property. The grubs eat all of it and become high protein feed for the chickens. We also have a pond with tilapia in it that feeds a stilling basin. That basin holds fry fish and some crustaceans but it’s main function is to grow duckweed. That stuff doubles in about 24 hours and goes to feed both our chickens and the fish. It’s a bit of work keeping all the systems going but when it runs well it really saves us money on feed. I didn’t know that you could ferment stockfeed! I also had no idea that fermenting stockfeed increases nutrition for animals, I assumed it would be bad for them. I’ll have to do more research to see if stockfeed suppliers ferment their stockfeed. My birds don’t like fodder and it was a ton of work to make it. My mother grew up on a real farm during the depression. No one had any money but those who lived on the farm at least could eat well. My grandfather took in his brothers whenever they lost their jobs in the city and they then helped him work the farm. I always loved animals and wanted chickens when I was young, and a neighbor gave me some, but it was my mother who taught me how to take care of them. We never needed a garbage disposal as they ate all the table scraps, spoiled milk would be allowed to curdle until solidified and fed out. The chickens ate any bug that came out. My mother would flood the back lawn and then the cutworms would come out of the ground and we would turn the chickens out and they would find them and gobble them up. They loved the elderberries from the elderberry bush and a vining plant that my mother called brides tears grew around the coop and the chickens would jump to eat the small fruits from this vine. Squash and pumpkins make good chicken feed as well and produce a big crop, and will keep for a long time over the winter, if they are properly stored and kept dry. They love the seeds from melons as well as the rinds. I have known some to grow safflower as chicken feed. It is basically a thistle type of plant and makes a lot of oily white seeds that the chickens love. Be sure to keep good hunting kitties around to deal with annoying rodents that are always attracted to chicken coops and the crops you plant to feed them. My neighbor gives me the spent grains after he has brewed his beer. I get probably 20lbs every 2 weeks in summer. I ration it out,as I have gotten mixed reviews as to the health aspect of it. But, the hens do like it, and it freezes well when I need to save it. I love it,thank you for all info. Chickens love mulberries. Good for humans too. Mulberries grow on trees not bush as the nursery rhyme goes and can take a few years to produce but well worth the effort. I also like to process apples into applesauce and when applesauce is put in front of them, they go crazy. And not to forget pomogranets, these trees will also grow inside if you are in colder climates. I have a worm bin, one of the ones with stacked trays, and rather than pick all the worms out of the finished castings, I just dump the lowest tray into a kids’ wading pool and let the chickens dig around and eat all the worms they can find. They like digging around, it’s homegrown extra protein, and after a few days I have nice dried-out picked-over worm castings ready for the garden or for potting soil blends. 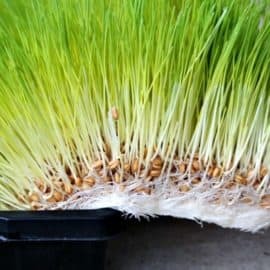 I also sprout wheat grass (and barley grass, and rye grass…) for them inside year-round. When I’m doing it right, I have a new slab ready for them every day. I pull the whole mat out of the tub, shake it out a little, and and put it in the run. They’ll eat the grass and eventually most of the sprouted grains, too, and it helps with the bright yellow yolks. Thanks for the great tips. I’ve used many of them including the grub bucket which we fill with roadkill and the chickens love the fresh protein. Another suggestion if to get food scraps from a local restaurant or, as I did, bring home the trash from the breakroom at work. The girls loved rummaging through the trash to find bits of salad or sandwiches, even chicken bones and fruit. The first few times, they tried to eat the paper plates and napkins, but once they figured out how to find the good stuff it worked great. They especially loved it when we had a catered lunch and they got to peck the leftover mac and cheese. An extra bonus was that my yard got a good many coffee grounds and I could recycle stuff that others had thrown away. I have used many of these ideas too, including the meal worms. the most incorrect idea is that meal worms are yucky. they are NOT. you get them live in a cloth bag, which you turn into a container with a lid that you have added oatmeal to, along with a piece of carrot for liquid. place them in a dark corner, making sure that you keep replacing the carrots, and after a short time, they turn into beetles. I then feed the bugs to my chickens, who love them. no fuss, no muss. Also, just found a supplier for spelt, which is the leftover grains used to make wine or beer. And I can get it for $1 gallon. so pretty cheap. thanks for your info, as it has helped me a lot with my chooks. and produce an organic salad every fall or winter day, mixing the greens with sprouted hard winter wheat (organic, from the grocery store, in 25 # bags). Happy chickens! And the best eggs ever! And I keep a couple of geese … no predator problems! (Fingers crossed). 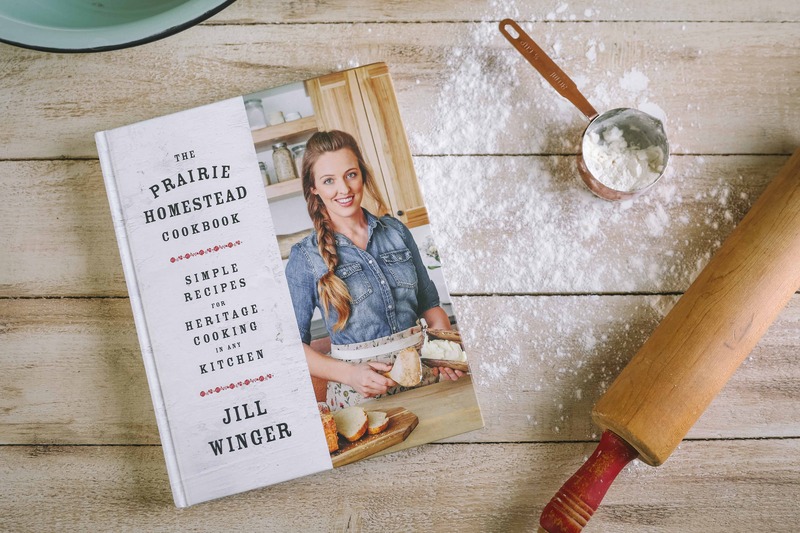 Howdy Jill my wife and I are fans if your homestead. We alsi have a very small one. We raise boer goats and Tamuk rabbits. I also compost using black soldier fly larvae. I promise you it isn’t nearly as creepy or nasty as it seems. As a bonus you can have them compost all of your manure and turn it into an even better soil amendment for your garden!!! Can you give chickens bacon grease mixed with bird seed and then frozen for a winter feast? I think I read that she does not recommend bacon grease due to the nitrates and sodium. I can’t believe the wealth of info on this page! What a help for a person who’s never raised chickens. I have been trying to justify keeping the chickens after they no longer raise eggs because I have a hard time killing anything that moves. Thanks Jill and everybody who contributed their ideas. We were growing the fodder. But stopped, we are having trouble getting the barley seed. We live in Illinois and can’t find it local, that sprouts before it molds. 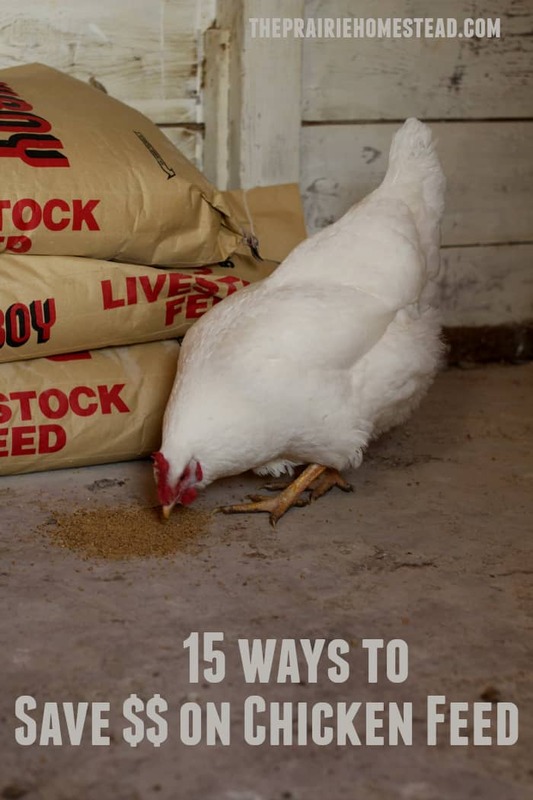 If you have chickens then it really can be beneficial to figure out the best ways to save on feed. I particularly like that the article recommends buying the feed in bulk. Of course, if you do decide to do this, you will want to make sure that you have a nice, dry place to store the seed so that it does not start to mold. If you live near any Amish farms, they may be able to tell you where they get their feed. We belong to a milk share group and the farm just down the road from the Amish milk share farm does custom feed. They normally do not use GMO seeds or Roundup. That’s a smart idea– I wish we had Amish here! Would love to get on your newsletter/follow-up comments list. City dweller now but trying to get ready for move to homesteading lifestyle next year. Thank you for what I anticipate to be a gold mine of helpful information! I was wondering about your suggestion on culling out the non-producing hens. We have 10 chicken that all look the same. During the summer we were getting 7 eggs per day. How do you go about determining who isn’t laying or is perhaps eating eggs? Here is a link to the answers for your questions. Googled for how to tell if a hen is laying, and this answers most of the questions asked here. I,d like to add when milk goes sour or curdles the chooks love it. Just pour into a container. They will also clean up any yoghurt out of its container. For gardening and chooks. The back to eden youtube will give much insight into chooks and gardening. For instance grow extra greens for your chooks kale, alll the bassicas are hot favorites. Plants that have gone to seed. Alll adds to their diet, l try to throw them a bunch everyday. Thanks.